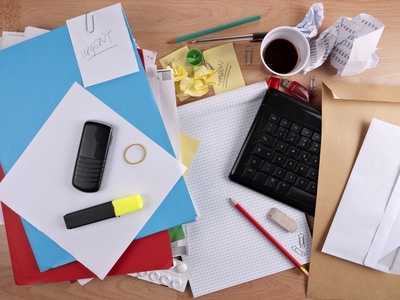 Have you ever met someone with a messy desk or cluttered office that uses it as a way to demonstrate how busy or important he or she is? Having a visual indicator of what’s going on can be helpful, but there’s a point where it starts getting out of control and begins to take a toll on you and your productivity. There’s no need to wear your clutter – whether physical, digital, or schedule-related – as a badge of honor. Clutter has real costs – and in order for you to stay productive and sane, it’s important to recognize those costs and look for strategies to overcome them. Clutter costs you opportunities. When you attend a networking event, what do you do with the business cards you collect? If you’re like many of the people I work with, you spend lots of time networking, meeting people, and collecting their cards – only to get the cards back to your office, put a rubber band around them, and never follow-up again. How about the phone leads that you receive and write down on whatever scrap of paper happens to be around (and then proceed to quickly lose)? If these end up as piles on, around, and under your desk, you’re losing out on opportunities. Instead of cluttered piles of information, develop a system for follow-up so that you can take action on those important contacts. Clutter costs you money. Buried in those piles of paper on your desk could be an unpaid bill, or an offer for a credit card at a lower interest rate than you’re paying right now. Even though those items are “somewhere,” if you can’t find them and act on them easily, clutter has taken a toll – often in the form of late fees, higher interest, or missed deadlines. I’ve worked with quite a number of clients who have plenty of money in the bank, but have consistently been paying bills late (and incurring fees) because they simply can’t put their hands on their bills, don’t have a system for paying them regularly, and forget about them. Create a strategy so that you’re always on top of any documents that could have a financial impact on you or your business. Clutter costs you stress. Even though clutter, disorganization, and lack of productivity can cost you money and may force you to miss out on important opportunities, it has an even bigger, more far-reaching consequence in your life: stress and overwhelm. Now, it’s true that there are some folks out there who seem to function well when there’s a cluttered environment – and if that’s you, great. But what I know from working with my clients over the years is that a cluttered environment, lack of systems, and nowhere for your eyes to rest in your space can create almost paralyzing amounts of stress, lack of focus, and a sense of generalized business overwhelm. Make a plan for how you’re going to tackle each area of your space or each system that you need to create, and then follow it step-by-step to get unstuck and relieve yourself of clutter-related overwhelm and stress. What are some of the ways clutter costs you? Sound off in the comments below. Could not agree more! I am also a lot more productive when my office is clean. It gives me great positive energy and I find I am able to accomplish more.